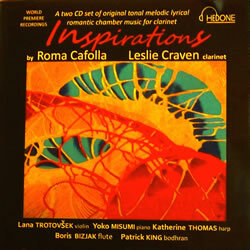 In April 2014 Leslie Craven, principal clarinet with the Welsh National Opera recorded a number of Roma's works. He was joined by violinist Lana Trotovšek, pianist Yoko Misumi, harpist Katherine Thomas, bodhrán player Patrick King and flautist Boris Bizjak, who also recorded and engineered the sessions at Wyastone Studios on Hedone Records. The double CD, titled Inspirations, is now on sale, priced at £13.50, which includes VAT and P&P within the UK. Reviews in this space mostly concentrate on international artists, big-name orchestras and venerable composers. For a change, here's a collection of music that should be within comfortable reach of talented players at home, music that would be invaluable to anyone studying the clarinet. A charmingly lyrical selection of single pieces, sonatas and fantasias from Derry-born composer Roma Cafolla, it won't set the world on fire but will make a solid addition to the chamber repertoire. Cafolla was inspired to write by Leslie Craven, principal clarinet at Welsh National Opera, who plays here with his trademark creamy tone. Pianist Yoko Misumi , violinist Lana Trotovšek, harpist Katherine Thomas and flautist Boris Bizjak make valuable contributions. For purchases of more than two double CDs, please contact Roma. Cara Gianna was written after the birth of the composer’s “miracle child” (so called because at the time Gianna was born the composer had been seriously ill). Roma describes her children as ‘absolute treasures’ and the work is written with the all the motherly love imaginable. The work opens with a hauntingly beautiful theme which develops into a serene middle section, recapitulating to an augmented, extended and peaceful close. Coastal Suite was written after a visit to Innishowen, which overlooks the confluence of the Foyle River and the wild Atlantic. It is a place evoking magic and memories for the composer. Each piece is a cameo of the different moods of the coastline from dawn to dusk. Moto Perpetuo is a light-hearted virtuosic romp reminiscent of a comedic Sicilian gangster movie sound track. Loosely written in rondo form it explores the unique interplay possible when three exceptional musicians bring their talents together. Each player echoes the other and competes to embellish the theme with ever more extravagant augmentation. A fun piece inspired by Leslie Craven and his virtuosic friends Lana Trotovšek and Yoko Misumi. Lost Childhood was inspired by thoughts and images of the composer’s childhood after a deep conversation with her mother. At that time the composer was very ill and her mother outlined her regrets and thoughts about life. This struck a resonant chord within the composer and this work is the product of the anguish caused by the conversation. Composed for clarinet and piano (also playable with harp) this piece explores the different moods of childhood and adolescence and is essentially autobiographical, reflecting the heartbreak of separation from her family when she was sent to boarding school. Gig-Saw opens with a beautiful, sadly introspective clarinet melody accompanied by harp interjections. This is followed by an upbeat bodhran, violin and harp “Irish Gig” (hence the name) which changes the mood completely. Both of these contrasting themes reoccur throughout the piece and are present in ever more intricate notation and rhythm. The clarinet and violin become more and more intertwined until they finally join to play the same melodic and rhythmic material in accelerating tempi as the piece modulates upward in semitone movements. The bodhran has a crucial rhythmic role and the ability to vary its pitch and the harp lends a truly Celtic flavour to this delightful work. Canzone has a tempo marking : “Larghetto” and is neo–classical/romantic in style. The clarinet has a beautiful sustained melody line complemented by the accompanying piano. The interplay between the instruments is close and ends in a gentle final pianissimo. This was one of the first pieces inspired by Leslie Craven and performed by him on several occasions with accompaniment by the composer. Ambidexterity was originally composed as a standalone solo. This piece became the third movement of the first Clarinet Concerto ‘Ambidexterity’. In this re-worked version for clarinet, violin, harp and piano it is a piece of great vitality. It is a fusion of Latin and Celtic idioms, humorously referred to by Leslie Craven as a “Gigatella” or “Taranta – Gig” The name came about because of the ambidexterity needed to master any instrument and because the composer is in fact ambidextrous. The opening flamboyant, jazzy flourishes give way to a reverential bridging passage of contrasting tempo and mood. After the slower section the piece returns to the jazzy virtuosity and ends in a triumphant mood. Tango Per Tre (originally written as a solo clarinet work for Leslie Craven) has strong rhythmic interest and interplay between the three instruments. It has a suggestion of smoky sensuality and is evocative of romance. Ebony The second movement of the first Clarinet Concerto, this has become a favourite with players and audiences. Its haunting lament–like melody and swooping virtuosic phrases were designed to show off the tonal control and virtuosity of Leslie Craven for whom it was written and who is considered by the composer to be the definitive interpreter of this beautiful work. Each of the phrases in the opening grows out of the previous thought. The middle section of flowing crotchets is embellished by semiquaver flourishes then after a brief pyrotechnical episode of heart-searing, coruscating demisemiquaver scales returns to calm, finishing in totally serenity. Sonata Capriccio Lirico was inspired by, written for and dedicated to Leslie Craven. The first movement is a “Pastoral” in 6/8 time. The second movement is dark in mood and soul-searching, morphing into a gentle yet lugubrious melody. An unusual cadenza bridging passage composed by Leslie Craven, loosely based on thematic material of both second and final movements links the second and third movement. The third movement is flamboyant, virtuosic and challenging for the performers who appear to be vying for supremacy in the race to the finish. Ella Lucia This piece is a beautiful serene melody which flows seamlessly between each instrument. Written for clarinet and harp to honour the birth of a granddaughter. Photos by Roma Cafolla/Leslie Craven/navyblur/Boris Bizjak/Nikos Tsogkas.